Tradewind Window Cleaning of Orange County offers low and high pressure cleaning for all types of surfaces. Typical services include building and house siding, driveways, walkways, brick, concrete, stucco and stone cleaning, deck, patio and fence cleaning, and low pressure roof washing. We ensure the appropriate usage of water pressure for each unique surface to limit the possibility of damaging your property. We highly recommend pressure washing the exterior of the building before any window cleaning service. To extend the life of your exterior paint, it’s a good idea to have the exterior of the house washed down annually. Pressure washing is the growing application of high pressure water spray. Produced by specially designed pumps, this spray is a hundred times more powerful than the typical garden hose. On concrete it is used to remove unsightly mold, bubble gum, and other dirt stains. Wooden decks are returned to the look of new wood, void of graying and fatigued finishes. And on houses, the appearance of siding (namely aluminum and vinyl) is greatl improved by removing pollution, mildew, and other signs of neglect in San Antonio. Do I need to be there when you’re working on my property or business? No, of course not. We understand that you are just as busy in life as we are cleaning. We do ask that all windows are closed, all driveways or areas that need to be cleaned are cleared, and all fragile decorations are put away. Are your chemicals bad for the environment? Can you cause damage to my property or surfaces you clean? An inexperienced pressure washer could cause damage by using too much water pressure on any given surface. That’s why it is important to hire a trained professional that know the right amount of pressure to use on the right surfaces. 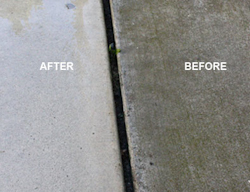 It is obvious to see the benefits in pressure washing. The exterior of your home and business says a lot about the interior of your home and business. Most people take pride in keeping themselves and their homes clean. No one wants a neighbor with a dirty house, driveway, or poolside. And no one wants to do business with a poorly maintained company. We will keep your business clean so you keep the business coming in the doors. Can you remove oil stains from my garage or driveway that have been there for years? Yes, in most cases. Oil stains can seep through concrete and after years of resting in the concrete it makes it much more difficult to restore a brand new look. This is why we use chemicals and detergents that dig beneath the concrete and eat away at the oils. Some stains will be completely eliminated and others will leave a small gray stain left after the cleaning. But either way it will look much better after being restored and cleaned by professionals. include cleaning house exteriors (siding and brick face), decks, patios, awnings, walkways and fences.